"Harmonas House, one of the several sons of Conrad House and Engelgalast name unknownwas a Loyalist and is mentioned in Mohawk Valley writings as being quite active during the American Revolution. After the war he was given a grant of land near Beamsville, Ontario, Canada, and most of his children who moved there with him settled there. It is believed that some of his children remained in the United States." Changes? Additions? Complaints? Outright insults? E-mail me here. Just as Johann Christian had been forced out of his homeland for religious and political reasons in 1710, some of his descendants now faced the same persecution and expulsion at he end of the century. 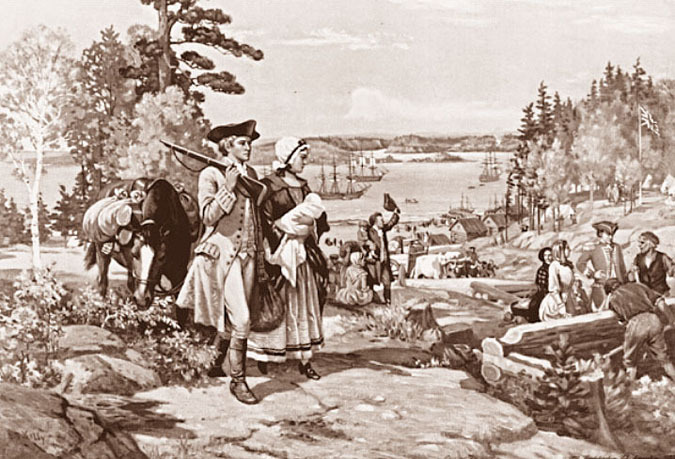 United Empire Loyalists landing at the site of Saint John, New Brunswick, 1783. New Brunswick was largely created by the flow of Loyalists into the region. Print by John David Kelly (1862-1958), before 1935. (National Archives of Canada, C1829). 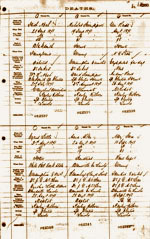 AUTHOR'S NOTE: The genealogy of the Canadian House line of George House was largely ignored in The House Family of the Mohawk, so the story of his succeeding generations is drawn from a family history by his descendant, Jim Abohbot, Ancestry.com, from the book Annals of the 40 by R. Janet Powell, and records of Butler's Rangers. SOURCE INFORMATION: National Archives Case Files of Pension and Bounty-Land Warrant Applications Based on Revolutionary War Service, compiled ca. 1800 - ca. 1912. This first line could end up being somewhat controversial. The House Family of the Mohawk states quite explicitly that George House, brother of Harmanus, fought on the Patriot side in the war and lived out his days in New York. Frustratingly, not much work had been done on the family line, but a George House was listed on area muster rolls, and was living on a veteran's pension in New York in the 1800's. His application, at right, states that he was the only George House fighting for the Patriot side in that part of New York. The application has no mention of a wife or children, but it notes that George served with an "Elias House" in the same unit. This is strange, because Conrad House had no son we know of who was named Elias. Could this George actually be from another line of the family? There was also a Loyalist George House living in the same area, who served in Butler's Rangers, had his property confiscated by the United States government, and applied for land in Canada on 28 Mar 1797. He ended up settling beside Harmanus, on Lot 9 Concs. III and IV in Ontario. Was this George also related to Harmanus as a cousin? Uncle? Nephew? Well, some descendants of this man living in Canada today were told in family histories that he was actually Harmanus's brother, making a grand total of two Loyalist sons by Conrad House to battle two Patriot sons. I. Frederick House, born 30 May 1771. III. George House, born 1 Apr 1779 in Mohawk Valley, N.Y., Mennonite Cemetery, Stevensville, married 26 July 1799 in Ont., in Canada by 1799. He married Esther Morningstar born 26 Oct 1779 in Bedford County, Pa., died 27 May 1866 in Stevensville, Mennonite Cemetery, daughter of Jacob Morningstar and Sarah Mae Brunner. They had the following children: Sarah, Benjamin, Mary, Rebecca, Martin, Jacob, George, and Peter. i. Mary Catherine House, born 4 Dec 1875 in Bertie Twp., died 1906 in N.F., Drummond Hill Cemetery, N.F. She married Noble Luther Benson, born 12 Aug 1870, died 24 Dec 1958 in N.F., Ont. (Drummond Hill Cemetery), son of Michael Benson and Ruth Dunn. They had a daughter: Vera Gwendolwn, born 1904 and died Apr 1905 in N.F. (Drummond Hill Cemetery). After Mary died, Noble married Caroline Nellie (or Nettie) Bossert. ii. Jonas House, born 6 Apr 1869 in Bertie Bay, Ont., died 1949 in Niagara Falls (Drummond Hill Cemetery). He was a jeweller in Welland, BIC. On 30 Dec 1896 in Crowland Twp., he married Sarah Jane Haun, born 9 July 1877 in Bertie Twp., died 1959 in Niagara Falls (Drummond Hill Cemetery), daughter of George Haun and Mary Ellsworth ('j-zavitz'). They had a daughter, Grace Mae House. iii. William Henry House b. 1871 in Welland County, Ontario, Canada (birth registration gives date of birth as 18 Nov 1870); He married Agnes Marie Foster (1873-1952). William died in 1961 and is buried at Lundys Lane Cemetery, Niagara Falls, Ontario, Canada; Plot: Sect C, Plot 92, Grave 1. Inscription: "House; In Memory Of William House, 1871-1961; His Wife Agnes M Foster, 1873-1952.". iv. George Burger House b. Oct 1872. George died in 1943 and is buried at Drummond Hill Cemetery, Niagara Falls, Ontario, Canada; Plot: Sect 05, Plot 558, Grave 1S. Inscription: "House; George B House, Born 1872, Died 1943; Sarah Matilda Kelly, Wife Of George B House, Born 1863, Died 1942; George Kenneth House Died 1905 Aged 8 Months." George married Sarah Mathilda Kelly (1863-1942) and they had one son:. 1. George Kenneth House (1905-1905). ii. 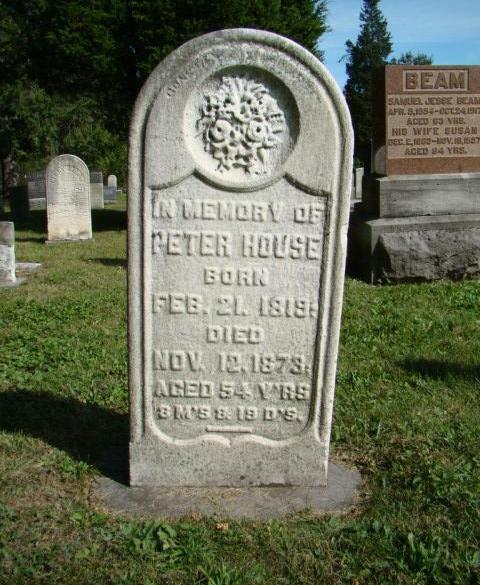 Reuben House, born 13 Sept 1870 in Bertie Township & died 29 Sept 1891; buried at Fairview Cemetery; unmarried. v. Sarah Augusta House (1876-1954) Burial: Fairview Cemetery, Niagara Falls, Ontario, Canada. vii. George Aaron House b. May 18, 1880 in Welland County, Ontario, Canada; Spouse: Nellie May Fretz House (1887 - 1984); George died in 1977. Burial: Fairview Cemetery, Niagara Falls, Ontario, Canada, Plot: Sect 7, Plot 426, Grave 1. Inscription: "House; In Memory Of George A House, 1880-1977; His Wife Nellie M Fretz, 1887-1984". 1. Verna Georgia Fretz, b. in Niagara Falls, Ontario, Canada on 26 May 1907 to James Fretz and Val House. Verna Georgia married Jack Stanley Payne (1913-1976). She passed away on 6 Jun 1989 in Niagara Falls. 2. 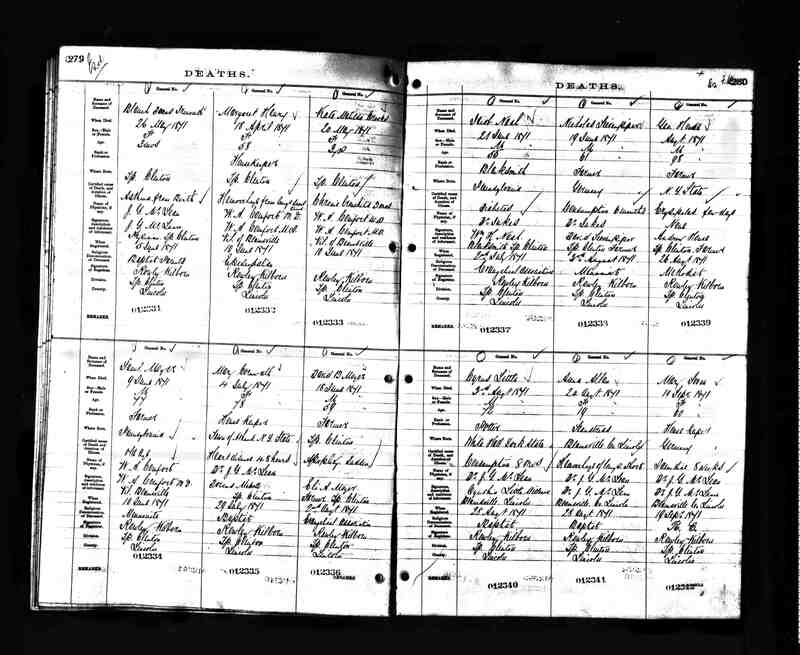 Avis Katharine Fretz, b. in Niagara Falls, Ontario, Canada on 24 Apr 1912 to James Fretz and Val House. Avis Katharine married William Winston Abohbot (1905-1984). She passed away on 21 Apr 2000 in Niagara Falls. George built his retirement home on Robinson St. in N.F. after Catharine died. c. Jacob House b. 21 Dec 1844 in Welland County, Ontario, Canada. He married Barbara Climenhage House (1844-1928). Jacob died on 6 Mar 1898 in Humberstone Township, Ontario, Canada; Cause of death: Broke his neck in an accidental fall. Burial: Black Creek Pioneer Cemetery, Welland County, Ontario, Canada. Inscription: "In Memory of Jacob HOUSE, Died March 6, 1898, Aged 53 years 2 mos & 16 d's.". e. Peter House, born June 1849 & died 16 Aug 1878.
i. Mary E House b. 6 May 1858 in Ontario, Canada; d. 5 Mar 1859 in Ontario, Canada. Burial: Reformed Mennonite Cemetery, Welland County, Ontario, Canada. 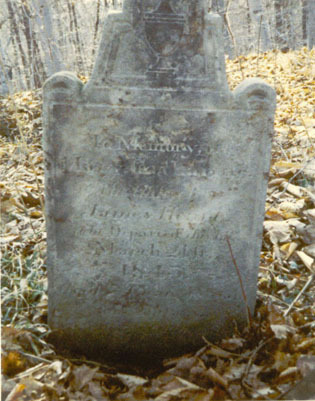 Inscription: "Mary E, Daughter Of George & Mary House, Died Mar 5, 1859 Ae 9 Mo's & 27 D's." j. Wilson House, born 31 Jan 1860 & United Brethren & labourer in Bertie Twp. & unmarried. k. Eliza House, in Stevensville & unmarried. l. Robert House b. 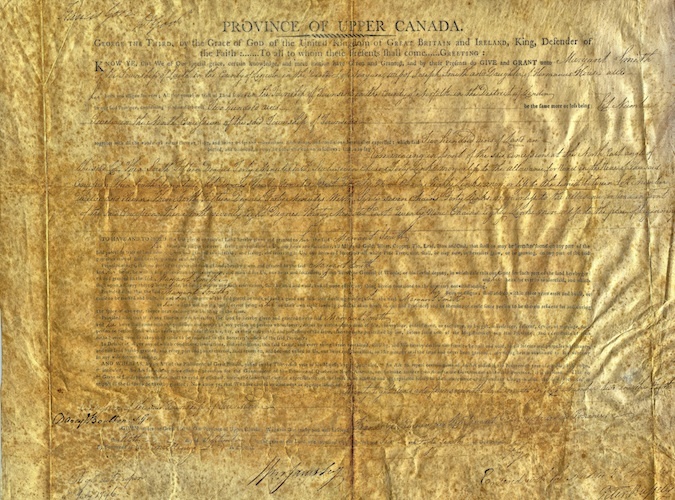 9 Aug 1862 in Ontario, Canada; d. 11 Aug 1864 in Ontario, Canada. 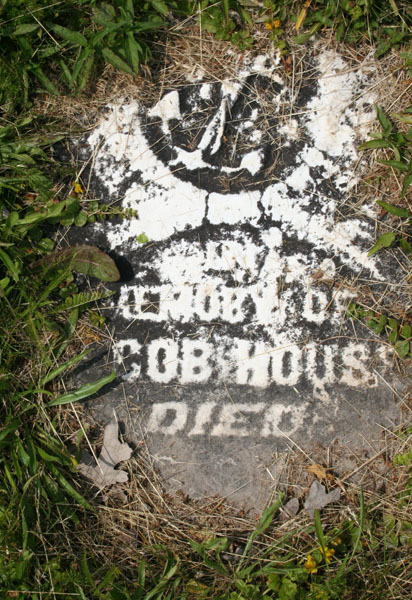 Burial: Reformed Mennonite Cemetery, Welland County, Ontario, Canada. Inscription: "Robert, Son Of George & Mary House, Died Aug 11, 1864 Aged 2 Y'rs & 2 D's." m. Mary Elizabeth House, died 1864.
i. Gordon, b. @ 1893; d, 7 Dec 1919.
ii. Grace A Beam (1905-1991). a. Robert James House b. 28 Jun 1859 in Welland County, Ontario, Canada; d. 27 Feb 1898 in Welland County, Ontario, Canada; Burial: Reformed Mennonite Cemetery, Welland County, Ontario, Canada. Inscription: "'It Is Well', In Memory Of Robert J House, Died Feb 27, 1898 In His 39th Year." IV. Catherine House, born c. 1780 in Mohawk Valley, N.Y. She married George Forbes, who applied for land 26 Feb 1819. VI. Hannah House, born c. 1780 in Mohawk Valley, N.Y. She married Charles Carpenter of Clinton Twp., and applied for land 7 May 1828. VII. Harmanus House, born Feb 1781, married 3 Jan 1808, applied for land 2 Dec 1806. He married Susannah Bradt born 1790 in Niagara, Lincoln Co., daughter of Myndert Bratt and Catharina Van Alstyne. 2. Amanda House, b. 1824.
a. Hugh House, born 1849.
b. Mary Etta House, born 12 Nov 1850 & unmarried. c. Melvina House, born 6 Apr 1852 & unmarried. h. Jennie House, born 1862.
j. Cora E. House, born 15 Nov 1868 & unmarried. l. Frank House, born 1870. 4. Freeman House, b. 1828. 5. Nelson House, b. 1830. 6. Wellington House, b. 1834. AUTHOR'S NOTE: The genealogy of the Harmanus House line was largely ignored in The House Family of the Mohawk, so a good portion of the story of his succeeding generations is drawn from Ancestry.com, from the book "Annals of the 40" by R. Janet Powell, records of Butler's Rangers, and a House Family History, by Christina Jones. SOURCE INFORMATION: Grimsby Historical Society, Grimsby, Ontario, Canada. A listing of Haus/House family Loyalists. Harmanus House was born in Aug 1734 according to some church records, and christened on 2 Oct 1738 as "Hermanus House," at the Dutch Reformed Church at Tappan (N.Y. Historian Report, Vol. 2, p. 694). This would make him a sibling or cousin of Conrad (born only five-to-ten years earlier), instead of his son, so it appears there were a few Harmanus Houses running around Tryon County. Records have him variously named Harmonious, Hermanus, Harmanus,, and even Adam. In 1751, he was married to Maria Margaretha Walrath (1729-1816). The Harmanus we are concerned with here was probably born in 1748 in Mohawk Valley, Tryon Co., New York, and his Christening was in 1751 in Stone Arabia, Tryon Co., New York (Stone Arabia Reformed Church records). Not much was written about Harmanus in the House Family of the Mohawk, but he is one of the most fascinating (and depending what side you were on) most heroic House members in our genealogy. As a Tory who rode with Butler's Rangers, he fought for his beliefseven against members of his own familyand stayed true to those beliefs until the day he died. Most family histories claim that Harmanus was the only Tory who fought with the British during the Revolution, and as a Loyalist, emigrated to Canada. However, early records of Niagara give the names of Phillip and George House. In the War of 1812, Andrew, Frederick, and Patrick served with the 4th Lincoln Regiment and Nicholas House with the 2nd. Illustration by R. J. Marrion. Fellow of The Company of Military Historians of America. Victoria Gallery, London, England. 1992. Butler's Rangers were raised by Major John Butler, an ex-officer of the Indian Department in September, 1777, comprised of eight companies of experienced woodsmen. Two of the companies were trained in the way of the Native American and could speak the Iroquois language. The unit was used as raiders along the New York frontiers, and became notorious after defeating a force of militia in the Wyoming Valley in July, 1778, when aided by their Iroquois allies, they killed and scalped most of the inhabitants. Harmanus himself was credited with shooting and scalping John Bellinger, according to the book, "The Frontiersmen of New York" by Jeptha R. Simms (Albany, NY, 1883). Harmanus ended up in the Clinton township of Niagara County, Ontario, Canada. The name "Niagara" referred to the area around Fort Niagara, now in the United States. In 1779, as a result of the Revolutionary War, Sir Frederick Haldimand proposed that the land on the west side of the river be settled to provide food and support for Fort Niagara, which then still belonged to the British. By 1781, Colonel Butler was able to report that four or five families had settled, and Peter and James Secord were about to build saw and grist mills. The next year, sixteen families had settled, most headed by former Butler's Rangers, including Harmanus. Before the revolution ended officially in 1783, Butler asked King George III for permission to release officers and soldiers with families at Fort Niagara, so that they could settle in present-day Niagara Township. "These people were bred farmers, and I am of the opinion will soon be useful to this post, as well as to enable them to support their families comfortably, which at present is very difficult," Butler told King George in one communique. The families struggle along, ripping roots from the ground and trying to cultivate the virgin land. A contemporary list of the heads of families (Butler's Rangers) at the settlement of Niagara, in 1784 mentions Harmanus as the head of his family, with one woman, three boys, two girls. I. Daniel was born on 28 Dec 1763 and baptized 17 Jan 1764 at the Dutch Reformed Church of Stone Arabia, New York. "Daniel. Son of, Hermanus Haus and ux.Margaretha. Sp. Jacob Majer." He was listed in Niagara, Ontario in 1787 with a wife and one daughter. In 1791 he was settled on Lots 18, 19, and 20. Conc. 11, Clinton township. The Ancaster House families come from Daniel, whose son David settled on the south half of lot 26/3; and from the Daniel's brother, Joseph, who settled on lot 40/3 for a few years (see below). b. Peter House (b. 1813). c. Philip House (b. 1817). f. Rebecca House (b. 1839). 2. Abraham House (twin) was born on 2 Aug 1792 in 1654344, Ontario, Canada, and died in 1793 in Yarmouth Centre, 1654296, Ontario, Canada. d. Elizabeth House (b. 1826). f. Metta Bertha House (1840-1841). 4. Deborah House (b. 1794). 5. Margaret Mary House (1796-1885). 8. Lewis House (b. 1802). 12. Elizabeth House (b. 1810). 13. Phoebe House (b. 1812). 14. Mary Reign House (1815-1887). 18. Sarah Ann House (1824-1909). 19. Julia Ann House (1827-1828). 20. Joseph Elijah House (1829-1852). Joseph died on 26 Jan 1831 in Ancaster Twp., Wentworth Co., Ontario, Canada. 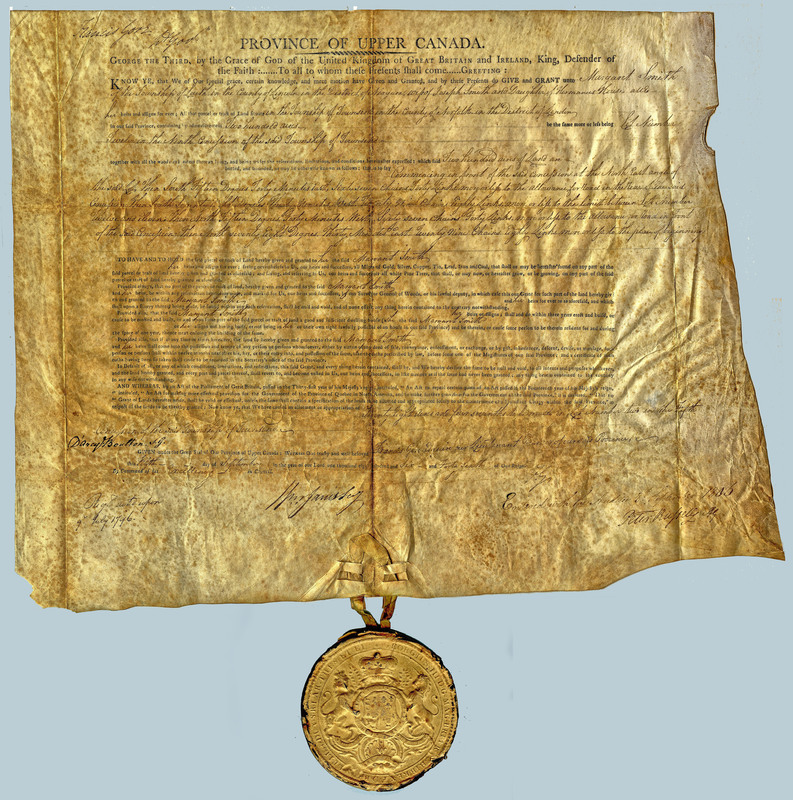 Will & Probate: Wentworth Surrogate Court document #105-1831. Microfilm MS 638-2, Archives of Ontario, Toronto. Grave of Mary Catharine House-Henry in the Henry Graveyard, Clinton, Ontario: "In Memory of Mary Catharine, Wife of James Henry Who Departed This Life March 21st 1843." b. Sara Maria Henry (1811-1861). 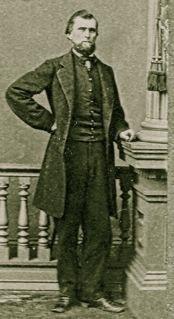 c. Isaac Brock Henry (1812-1889). f. William Butler Henry (1819-1882). g. James Smith Henry (1820-1882). h. John Butler Henry (1822-1893). a. Andrew McDurphy House was born 1828 in Clinton Township, Lincoln, Ontario, Canada. He died on 19 Jul 1867 in Clinton Township, Lincoln, Ontario, Canada. b. Jared Stucking House was born 1832 in Clinton Township, Lincoln, Ontario, Canada. He married Mary High. Their marriage on 10 Jan 1861 in Clinton Township, Lincoln, Ontario, Canada (0). Residence 1891 in Lincoln and Niagara, Ontario, Canada. Occupation 1891 (Carriage Trimmer). He died on 23 Jan 1901 in Lincoln, Ontario, Canada. c. Caroline House was born on 06 Jul 1836 in Clinton Township, Lincoln, Ontario, Canada. She married Jared W. Moyer. Their marriage on 04 Jun 1861 in Clinton Township, Lincoln, Ontario, Canada (0). She died on 24 May 1919 in Wentworth, Ontario, Canada. Residence in Ontario, Canada. d. Eliza Jane House was born on 06 Oct 1839 in Clinton Township, Lincoln, Ontario, Canada. She married Frederick Philip House. They were married on 06 Jul 1859. Residence 1922 in Beamsville, Lincoln Co, Ontario. She died on 29 Nov 1931 in Wentworth, Ontario, Canada. e. Horatio Nelson House was born on 05 Oct 1842 in Clinton Township, Lincoln, Ontario, Canada. Residence 1882 in Clinton Township, Lincoln, Ontario, Canada. He married Annie Rose. They were married on 11 Apr 1882 in Lincoln, Ontario, Canada. He died on 04 Jan 1927 in Lincoln, Ontario, Canada. f. Calvin House was born 1820 in Clinton Township, Lincoln, Ontario, Canada. Residence 1891 in Norfolk North, Ontario, Canada. He died on 18 Jan 1896 in Norfolk, Ontario, Canada. g. Frederick House was born on 22 Dec 1822 in Clinton Township, Lincoln, Ontario, Canada. He married Sarah E House. They were married on 09 Jun 1846 in Ontario, Canada. Residence 1861 in Lincoln, Ontario, Canada. He died on 13 Mar 1902 in Grimsby, Wentworth, Ontario, Canada. h. Prudence E. House was born 1825 in Clinton Township, Lincoln, Ontario, Canada. Residence 1861 in Lincoln, Ontario, Canada. She died on 18 Oct 1888 in Beamsville, Lincoln Co, Ontario. i. Nancy House was born on 05 Feb 1831 in Clinton Township, Lincoln, Ontario, Canada. Residence 1861 in Lincoln, Ontario, Canada. She died on 12 Jun 1875 in Lincoln, Ontario, Canada. Anna Margaret House-Smith (b. 1 Feb 1771, d. 1857; buried Smith Cem., Louth Tp., Lincoln Co). She was the daughter of Harmanus House UE (Butler's Rangers) and Maria "Margaret" Wallrad. She married Joseph Smith in 1790. Lot 3, Con.V, Louth was granted to Joseph Smith's wife Margaret, and probably other land for his children in the townships of York, Etobicoke and Townsend township, Norfolk County where several sons settled." 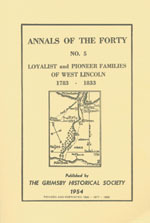 (Grimsby Historical Society, "Smith Family C, Louth twp," Annals of the Forty, Vol. 8, pp. 52-53. )(Their son Harmaunus Smith: The Story of a Pioneer Doctor - Harmanus Smith by Vivian M. Spack, E.E. ; elaborated by T. Roy Woodhouse, An Address to the Society given on January 8, 1960). (Harmaunus was named after his grandfather, Harmanus House, studied medicine later became a very successful doctor and politician). 1. Harmanus Smith (1790-1872) Dr. Hermanus Smith was born in the township of Barton, near by where St. Catharines now stands. He was not physically strong as a boy, and early showed a studious disposition. In the time of the war of 1812 he was not considered sufficiently strong to take a place in the ranks of the militia. Fortunately for the delicate and studious young man, there was a very competent and educated physician. Dr. Allen, living near his father's, with whom he became a student, and from whom he acquired his knowledge of the profession, and doubtless at the same time a good deal of general know- ledge. Like a few others who have been no mean medical practitioners in Upper Canada, he never attended a course of medical lectures, nor walked the wards of a hospital. Probably he received some information from Dr. LafFerty, if the supposi- tion be correct that he was the Dr. Smith who, in partnership with Lafferty, had an apothecary shop in the village of St. Catharines in 1818. Dr. Smith appeared before the Medical Board in October, 1819, and obtained his licence to practise. Hamilton and the surrounding country was the field of Dr. Smith's practice during his life. He married Miss Philmon, of Ancaster. His practice was extensive, and he acquired consider- able property. The valuable property on the mountain, owned by the Hon. Mr. Buchanan, was bought from Dr. Smith, who then purchased land in Ancaster, where he made his homestead and where he died. Dr. Smith was not only a successful doctor, but was honoured by being elected to represent in the Provin- cial Parliament the County of Went worth, in 1834. He had three sons, who are still living in Ancaster (1889). His only daughter married Dr. William J. H. A. Case. Using the text of ebook The medical profession in Upper Canada, 1783-1850. An historical narrative, with original documents relating to the profession, including some brief biographies by William Canniff.) HARMANUS SMITH engaged in farming until he became of age and he probably attended Niagara Military or grammar school. Later he studied for the medical profession under Dr. Allen. He passed the first medical Board in Canada in 1818. On 26 June of that year he married Elizabeth Filman (1792-1858). They first settled in Barton Township, Lot 15, Conc. IV, later moving to Ancaster Township. Professionally Dr. Harmanus Smith attained a high standing and attended the whole district from Woodstock to Niagara. Politically he was a member of the Reform party and was elected to the Legislature in 1834. He was defeated by Sir Allen McNabb in 1841 but again was elected in 1856. He owned 15 riding horses and traveled great distances by horse and boat. His saddle, his mortar and pestle and other medical equipment are still preserved by his descendants, who continue to live in the old homestead---Lot 44, Conc. V, Ancaster township. From---Annals Of The Forty: No. 8: Loyalist And Pioneer Families Of West Lincoln 1783-1833, compiled by R. Janet Powell, Grimsby Historical Society, c1957, Reprinted & Revised 1967 & 1978, Pg. 53. Vivian M. (Smith) Spack E.E., wrote "The Story of a Pioneer Doctor Harmanus Smith" published in Wentworth Bygones. b. Margaret Smith (1819-1841) married Dr. William J. H. A. Case. c. John Conrad Smith (1821-1897). d. Joseph Josiah Smith (1823-1896). 6. Margaret Smith (b. 1798). 8. James Henry Smith (1802-1874). 13. Benjamin Smith (b. 1813). 14. William David Smith (1814-1887). SOURCE INFORMATION: Archives of Ontario, Series MS935, Reel 2. 2. Harmon G House (1801-1882). 3. Nancy Ann House (1808-1885). 4. Cyrus B House (1811-1896). 6. Nancy Matilda House (1822-1896). 7. Dinah M House (1823-1894). These Canadian Houses were tough! And none were tougher than George, who died on 26 Aug 1871 in Clinton Twp, 1654315, Ontario, Canada, at the age of 98. 1. Joseph House was born Abt. 1784 in Mohawk Valley, New York. Residence 1800 in Otsego, Otsego, New York. He married Nancy L. Unknown. Their marriage Abt. 1800 in Otsego, Otsego, New York, USA (Census of 1800 - Joseph House). He died Bef. 1860. Nancy L. Unknown. She was born on 21 Jan 1783 in Vermont. Residence 1870 in Dansville, Livingston, New York. Her death on 03 Sep 1871 in North Dansville, Livingston, New York (Burial Greenmount Cemetery). Nancy states that she is the mother of 9 children in the New York Census of 1865, she is at that time living with her daughter Eliza House Hartmann and family. She is living in Middlesex Ontario, Canada in 1861 with Whipple Lovett and his wife and the census indicates she is not related to them. She is with a 14 yr old named Oreford Park. In 1860 she is living with Rosina House Dill in Buffalo with John A. Park, born about the same year as Oreford Park. a. Unknown House. He was born Bet. 1800-1804 in Otsego, New York. b. Unknown House was born Bet. 1800-1830.
c. Unknown House was born Bet. 1800-1830.
d. Rosina House was born on 10 Dec 1802 in New York. She married James Harvey Adams. They were married on 19 Dec 1824. Residence 1880 in Buffalo, Erie, New York, United States. She died on 19 Sep 1894 in Buffalo, New York. e. Clarissa House was born 1806. She married John Depew Van Norman. They were married 1825 in Buffalo, Erie, New York, USA. Residence 1852 in Norfolk County, Canada West (Ontario), Canada. She died on 24 Nov 1882 in Saginaw, Saginaw Co., Michigan. f. Unknown House. He was born Bet. 1810-1820 in Otsego, New York. g. Eliza M. House was born in Jun 1817 in Otsego, Otsego, New York. Adoption 1834 (By Uncle Frederick House). She married Henry Hartman. They were married on 04 Jul 1844. Residence 1870 in Dansville, Livingston, New York. Her death 1879 in North Dansville, Livingston, New York (Burial Greenmount Cemetery). h. Mary Ann House. Her birth on 24 Aug 1819 in Otsego, New York, USA (Baptism at Church of Snell's Bush). i. Sarah Jane House. She was born on 25 Sep 1822 in Otsego, Otsego, New York, USA. Her death on 29 Aug 1890 in North Dansville, Livingston, New York (Burial Greenmount Cemetery). 2. Daniel House was born on 21 Feb 1785 in Mohawk Valley, N.Y. Residence 1806 in York, Ontario, Canada. Burial 1862 in Glen Meyer Baptist Church Cemetery. He died on 31 Jan 1862 in Houghton Township, Norfolk, Ontario. Military Service was 18 REG'T (DOBBIN'S) N.Y. MIL. Petition of June 18, 1806 at York: "That your petitioner, Daniel House of Bertie Twp., farmer, is the son of James House of Bertie, praying for land as the son of a U.E.L."  (He was recommended for 200 acres.) The Gore District Militia of 1821-1824-1830 and 1838 The Militia of West York and West Lincoln of 1804, with the Lists of Officers TOGETHER WITH SOME HISTORICAL AND BIOGRAPHICAL NOTES ON THE MILITIA WITHIN THE TERRITORY AT PRESENT CONSTITUTING THE COUNTY OF WENTWORTH, IN THE YEARS NAMED. By H. HÇ ROBERTSON The Griffin & Kidner Co. Ltd.. Printers. Hamilton 1904: Clench; Major, Johnson Butler; Captains, Jacob Tenbroek, John Munro, Abram Nellis, James Henry, George Rangier, John Carpenter, Jonathan Moore, Smith Griflfin, William Nellis ; Lieutenants, Titus G. Simons, Wm. Carpenter, Daniel House, Joseph Adair, Allan Nixon, Philip House, Robt. Comfort, James Doddy, Solomon Hill; Ensigns, Henry Hickson, Ralph Walter, Edward Griffin, Pearce Moore, Richard Griffin, John Snyder, Joseph Smith, Jacob Beam, Jonathan Pettit; Adjutant, Adrian Marlat. Daniel House: Sponsors at his birth were Daniel House and Eva Windekker. 1796: House, Daniel - Praying for family lands. Ordered 200 acres family lands if not granted before, his wife having been included in a former order. Elizabeth. She was born 1792 in United States. She died on 18 Nov 1871 in Houghton Township, Norfolk, Ontario. Daniel House and Elizabeth. They had 6 children. a. James Winfield House was born 1816 in Tonawanda, Erie, New York. He married Sarah Ann Buckley. They were married on 14 Jun 1875 in Norfolk, Middlesex County, Ontario, Canada. Residence 1881 in Houghton Township, Norfolk, Ontario. He died on 31 Mar 1882 in Houghton Township, Norfolk, Ontario. Religion was Baptist. 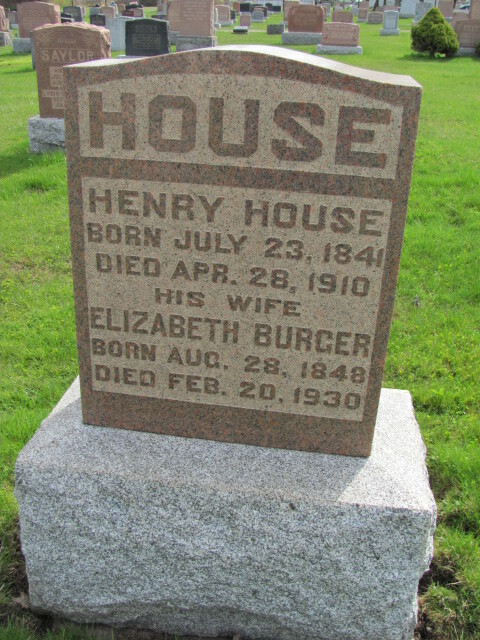 b. Nancy House was born 1830 in Ontario, Canada. c. Lewis A. House was born Feb 1833 in Ontario, Canada. He married Martha A. Smith. 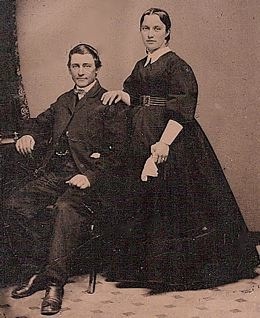 They were married on 25 Jan 1860 in Elgin, Ontario, Canada. Residence 1880 in Green, Mecosta, Michigan. He died Aft. 1920 in Michigan. d. Mary House was born 1835 in Ontario, Canada. e. Frederick House was born on 08 Apr 1839 in Ontario, Canada. He married Caroline Belore. They were married Mar 1865. Residence 1871 in Ontario, Canada. He died on 25 Nov 1912 in North Walsingham Twp., Norfolk, Ontario. f. Elizabeth House was born 1842 in Ontario, Canada. She married Andrew Raymond. They were married on 10 Aug 1874 in Ontario, Canada. She died on 29 Dec 1905 in Brantford, Ontario, Canada. Residence in Ontario, Canada. 3. John Conrad House. He was born on 12 May 1788 in Schneidersbusch, Mohawk Valley, New York. Baptism on 10 Jan 1789 in Dutch Reformed Church, St. Johnsville, Montgomery, NY. Will of John Connard House: Dated April 27,1854; probated Mar.12, 1855; Of Twp. of Maryborough, farm on E 1/2 Lots 18 & 19, Con. 13. Sons Conrad, John Foster, William Alton, George Frederick; wife Eleanor; daughter Lavinia - L50. 4. John House was born 1793 in New York. Residence 1820 in Waterloo, Waterloo, Ontario, Canada. He married Maria. She was born 1800 in United States. She was also known as Mary. They were married on 11 Jun 1816 by Robert Nelles, J.P. of Grimsby. John House and Maria. They had 4 children. a. John House was born 1833 in Wilmot, Waterloo County, Canada West (Ontario), Canada. Residence 1852 in Wilmot, Waterloo County, Canada West (Ontario), Canada. b. James House was born 1835 in Wilmot, Waterloo County, Canada West (Ontario), Canada. Residence 1852 in Wilmot, Waterloo County, Canada West (Ontario), Canada. c. George House. He was born 1838 in Wilmot, Waterloo County, Canada West (Ontario), Canada. d. Jacob House was born 1824 in Wilmot, Waterloo County, Canada West (Ontario), Canada. Residence 1852 in Wilmot, Waterloo County, Canada West (Ontario), Canada. He died on 26 Jul 1904 in Wilmot, Waterloo, Ontario, Canada. 5. Christina House. She was born 1795. Baptism 1796 in Niagara. a. Eliza M. House was born in Jun 1817 in Otsego, Otsego, New York (Adopted his niece). Adoption 1834 (By Uncle Frederick House). She married Henry Hartman. They were married on 04 Jul 1844. Residence 1870 in Dansville, Livingston, New York. Her death 1879 in North Dansville, Livingston, New York (Burial Greenmount Cemetery). Frederick House adopted brother Isaac A. House in 1819 in Livonia, Livingston County NY: "Ontario County Surrogate Court: Guardianship File pg 314." Sally. Her death on 10 Oct 1817 in Livonia, Livingston, New York, USA (Union Cemetery, Livonia, NY- Grave at Union Cemetery in Livonia, NY: "Wife of Frederick House"). Frederick House and Sally. They had no children. His death on 14 Nov 1844 in North Dansville, Livingston, New York (Burial Greenmount Cemetery Dansville, NY). 7. Lewis House was born on 23 Aug 1796 in New York. He married Catharine Mary House. Their marriage on 16 Jun 1818 in Clinton Township, Lincoln, Ontario, Canada (Rev. William Sampson). Residence 1852 in Lincoln County, Canada West (Ontario), Canada. He died on 11 Nov 1867 in Clinton Township, Lincoln, Ontario, Canada. Military Service was SWIFT'S AND DOBBIN'S REGIMENT (1814), NEW YORK VOLS. Petition of Sept. 14, 1841: "That your petitioner, Lewis House of Clinton Twp., is the son of James House, late of Bertie, U.E.L. he is 45 years old and wants 200 acres of land." (Approved.) Will of Lewis House: Died Nov. 12, 1867. - To Calvin, my oldest son, $1000 - To Frederick, my next son, $1000 - To Andrew McDurphy, my next son, $2000 - To Jared, my next son, $1200 - To Horatio N., my youngest son, $1100 - To daughters Prudence, Nancy, Caroline and Eliza J., $500 each. a. Unknown House. He was born Bet. 1812-1828.
b. Unknown House. He was born Bet. 1812-1828.
c. Unknown House. He was born Bet. 1812-1828. 9. Nancy House was born 1802 in Tonawanda, Erie, New York. Residence 1852 in Lincoln County, Canada West (Ontario), Canada. She died on 18 Jan 1870 in Clinton Township, Lincoln, Ontario, Canada. Petition of Sept. 14, 1841: "That your petitioner, Nancy House of Clinton Twp., is the wife of Andrew House and the daughter of James House. She is 39 years old and wants 200 acres as the daughter of a U.E.L." (Approved.) She would have been a second cousin once removed of Andrew House, if I have made the correct assumptions re the parentage of James (Jacob) House, U.E.L. a. James Philip House was born on 26 Feb 1835 in Canboro, Haldemand, Ontario, Canada. He married Anna Maria Crosby. Their marriage on 26 Feb 1873 in Gainsborough, Ontario, Canada (Wedding). Residence 1891 in Gainsborough, Ontario, Canada. His death on 27 Dec 1896 in Pelham, Welland, Ontario, Canada (North Pelham First Presbyterian Church). Burial in North Pelham First Presbyterian Church, Welland County, Ontario, Canada. b. Edwin Morris House was born on 28 Sep 1841 in Clinton Township, Central Huron, Lincoln, Ontario, Canada. He married Barbara Alice Roszel. They were married on 07 Dec 1880 in Lincoln, Ontario, Canada. He died on 20 Apr 1915 in York, Ontario, Canada. Residence in Ontario, Canada. c. Eliza E. House was born on 21 Jun 1837 in Clinton Township, Central Huron, Lincoln, Ontario, Canada. She married Philip High. They were married on 01 Dec 1864. Residence 1901 in Gainsborough, Ontario, Canada. She died on 28 Sep 1922 in Wentworth, Ontario, Canada. d. Achsah House was born on 05 Sep 1847 in Clinton Township, Central Huron, Lincoln, Ontario, Canada. She married James B Culp. They were married on 29 Sep 1880 in Wentworth, Ontario, Canada. She died on 22 Jan 1913 in Lincoln, Ontario, Canada. Residence in Ontario, Canada. VIII. Hulda House was born @ 1774 in Mohawk Valley, New York. She is listed as Harmanus's child in the court judgement against their family in 1783. IX. Angelina: B. Sep. 20 1777 Englge. Dau. of Hermanus Hauss and Margareth. Sp. Conrad Haus and Wife Englge. Dutch Reformed Church of German Flats. She is not mentioned in the court judgement against the family in 1783, so she probably died young. X. Harmonus, Jr., probably born in Canada. He married Susan Bradt on 2 Jan 1808, according to the records of Rev. Addison in Clinton township. His war losses were listed at 5-15 pounds. Meanwhile Harmanus Sr. settled into a farmer's life, and watched his family grow. He was an active member in the community life. He served on the first Municipal Council of Clinton Township in 1793 as one of two Wardens and as PoundKeeper. His name is on the Voter's list in 1812 but not on the list of 1816, which would indicate that he died sometime between those dates. It is said that he and his wife were buried on the farm but the stones marking their resting place have long been removed. Harmanus and his wife are believed to be buried on the family farm. Their house was destroyed at some point a rebuilt. Margaret Reid lived in the house for many years and when she died she left it to the Niagara Historical Society. It is now empty. The barn in front of the house also burned down and was rebuilt at some point but it still rests on the original foundation. The house is nestled right along the edge of the Niagara Escarpment, it looks down over the town of Beamsville and out onto Lake Ontario. 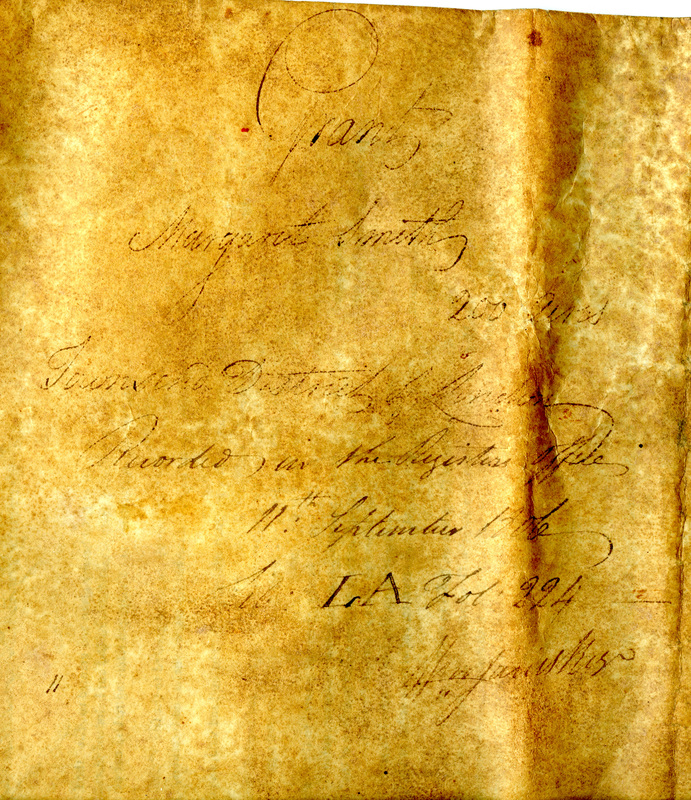 Harmanus's will was written 3rd of August 1816, and was probated in Oct 1822. Will of Harmanus House, Twp. of Clinton, Lincoln, Ontario; Dated Aug 3, 1816; died Oct. 8, 1822. First I order all my Debts to be Discharged. Secondly, I give and bequeath to Margaret my beloved Wife, all my household goods, and all Movable Effects, as long as she lives in this World, so as to be to her own Use and Comfort as long as she lives and can enjoy it. Thirdly, my Will and order is that my Son Daniel House shall have the sum of Five pounds Sterling, to be paid to him, after my Departure of this Life, out of my estate, in respect of his being the oldest of all my Children. Fourthly, I give and bequeath unto my Son John House my place or farm whereon I now live after the Departure of my Life, out of this World, unto him and his heirs in fee simple for Ever, it being Lots Number Nine and Ten, Fourth Concession in the Township of Clinton and containing One hundred and sixty-seven Acres, more or less. Furthur my son John House shall take into his Care or charge, my beloved Wife Margaret, his Mother, and see that she wants for nothing, find and provide Food and sufficient Meat, Drink, Firewood, and everything that may or can make her Comfortable and easy, as long as she lives, and see to it, that nothing of the property left to her is wasted, Damaged or Destroyed, if he can help it. And after mine and my Wife's Departure, the moveable property and effects left by her shall all be equally divided amongst all my Children, and if any of them Die before her, the same portion to their children. I likewise Constitute, make and ordain Nathaniel Griffen, and John S. Settzel (?) my Executors, of this my last will and testament. And do hereby utterly disallow, revoke and Disannul, all and every other former Testaments, Wills, Legacies, Bequests and Executors, by me in any ways before named, ratifying and confirming this, and no other, to be my last Will and Testament. In witness whereof, I have hereunto set my Hand and Seal, this third day of August, in the Year of our Lord, One thousand eight hundred and sixteen. TOP PHOTO: George House descendants, gathered in George and Kate House's Stevensville farmhouse in 1903. (Click here to enlarge.) The people are: RearGeorge House Jr., Jim Fretz, Marshall Zavitz, George House Sr.; MiddleMinnie Aspinwall House, Valla House Fretz, Orville Nicks, Rosanna House Nicks, Belle Terryberry House, Catherine Miller House; FrontAlice House Zavitz, Charlie Zavitz, Ben Nicks, Mike House, Fred House (photo courtesy of Jim Abohbot). ¹"The House Family of the Mohawk" was a compilation of genealogical articles written by Melvin Rhodes Shaver of Ransomville, New York, based on research by that he had done with genealogist Frank D. Duel in 1933. The articles were originally serialized in the "St. Johnsville Enterprise and News," of Montgomery County. Publisher Lou D. MacWethy released the paper weekly, from July 3, 1918 (v. 20, no. 4) to Dec. 4, 1941 (v. 67, no. 21). After a few more publishers and name changes, the paper's run finally ended in 1977. History online. ²Just because a parent has more than one child of the same name does not necessarily mean that the first child of that name had died. According to genealogist Henry "Hank" Jones: "What is kind of wild to our 21st century minds is that sometimes parents would have two or three children and gave them exactly the same nameall of whom survived. The consensus is that they were playing their early version of 'Vegas odds': knowing about the high incidence of infant mortality and gambling that at least one of their issue might survive bearing a special family name that the parents wanted perpetuated. For example, Johannes Heiner/Hayner, a Palatine fellow 1709er of your Christian Haus, had two sons named exactly the same: Johannes, both of whom survived; the emigrant Johannes Heiner himself also had a brother Johannes who survived too." 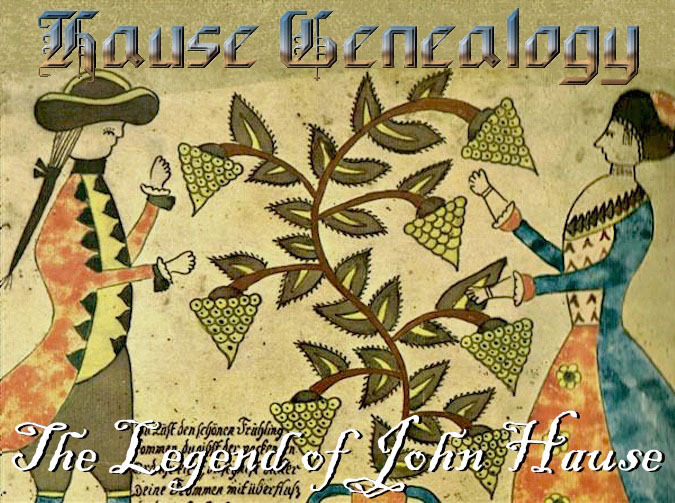 ³The genealogy of the Harmanus House line was largely ignored in The House Family of the Mohawk, so a good portion of the story of his succeeding generations is drawn from Ancestry.com, "Annals of the 40" by R. Janet Powell, records of Butler's Rangers, and a House Family History, by his descendant Christina Jones.